The Thing About Love is not listed as part of James' FBI/U.S. Attorney series, but takes place in the same world, much like Suddenly One Summer. Familiar characters from the series appear. Next to Love Irresistibly, this is probably one of my favorites of Julie James' works. This newest release was pretty amazing, to be honest, and even though there were a few things that frustrated me a little bit, it didn't seem to matter all that much to me. In light of how much I loved the dynamics between our main couple, and even between other side and minor characters, I don't even care that some parts of the book were kind of slow-going. The conflict between Jessica and John actually played out like a tacky home television family comedy at the beginning, truth be told. But I found the way that they handle their situation in the present rather a nice, mature touch, setting aside their problems to do their job without causing even more problems. And then actually talking about their conflict, even if neither of them will one hundred percent agree to how they remember their version of history from six years prior. I found the "she said" and "he said" chapters, both flashing back to our couple's respective accounts of how things had gone down during their twenty-one weeks at FBI training Academy, rather clever. It was presented well and DID show how such a petty conflict could have been born to begin with. Especially with each person jumping straight to conclusions without actually talking to each other first. While it seemed like a really childish competition, it also sort of gave their conflict a bit more depth than just "we didn't get along for reasons" and then leaving it at that. Once again, the progression of the story DID turn out a bit slow for the most part, but I loved the developments in John and Jessica's relationship. Their partnership on the job was actually a lot more fun to follow than when they started getting romantically involved, but the banter didn't fade any. I also loved seeing all the work that went into one undercover operation, and the emphasis on how some undercover operations could take longer than a couple hours or days, even. Also, for those familiar with Julie James' other work, there are some nice cameo appearances from beloved characters in the FBI/U.S. Attorney series--Jack and Sam, Nick McCall, and Vaughn Roberts. Once again, Julie James just has this way with words and story telling. Most importantly, I love the humor and the witty banter that are signature Julie James traits! 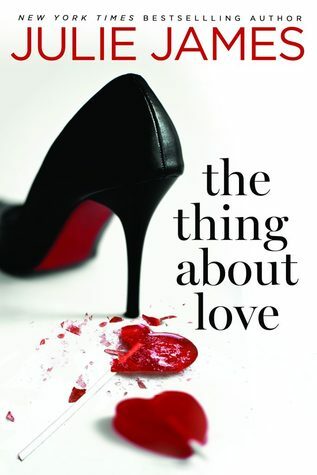 In spite of the fact that I had found her previous two contemporaries a bit mediocre, I am very happy with The Thing About Love, and am looking forward to the next release by Julie James. 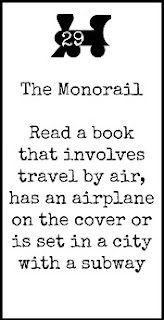 This book involves travel by air (characters travel from Chicago to Jacksonville throughout the book). Also, the book takes place mainly in Chicago, which has a subway system.